Engaging With and Demonstrating Learning (Michelle Meracis, Jonathan Nalder and Corrie Barclay) – Whereas interactive whiteboards demand a focus on the front of the room, having an iPad provides a portable medium to share with. I myself spent six months running an intervention group using the iPad as a means for students to sketch out ideas. Although I just used Paper53 in the past, something like Explain Everything provides more functionality in regards to text and shapes. In addition to this, Richard Wells describes how you can even using Explain Everything as a recordable whiteboard. Depending on the set up of the school, the content on the iPad can then be projected on a larger screen using a range of means, including Apple TV, Reflector or Air Server. Engaging with learning from a different perspective, Plickers allows you to easily gauge student feedback with only one device, while Post-It Notes and iBrainstorm provide different means to build ideas. Teacher’s PDA (John Thomas and Corrie Barclay) – Beautiful handwriting? Capture it! Great clay modelling? Capture it! Clever oral presentation? Capture it! The portability of an iPad allows for the ongoing documentation of learning that is and isn’t digital. This can range from still images, audio and video. What is great is that you can now auto-backup to Google Drive, taking away the pain of having to connect with the computer to transfer files. In addition to this, Bec Spink has shared how she uses Evernote to support this endeavour. While Brett Sinnett has written about how he uses Google Sheets offline to keep all of his formative assessment. Another possibility is to simply post content on a private blog or an application like Easy Portfolio to store information. What is good about making notes digital is the ability to easily organise information using tags and folders, making it much easier to sort things at a later date. Connecting with the World (Jenny Ashby) – Another suggestion is that the iPad can become the permanent connection with the wider world. Whether it be using Twitter to share learning or engaging an expert, such as an author; publishing work on a school YouTube Channel; using Skype to engage with another class from around the world; or maintaining a class blog to celebrate and reflect upon the learning that is occurring in the classroom. There are so many ways in which students can get outside of the classroom these days, the question is which means fits the context. Capturing and Creating – Going beyond just documenting work, the iPad provides a means for creating different products as a part of the learning process. Lately, my students have really taken to Adobe Voice, creating everything from radio advertisements to sharing thoughts and reflections. However, applications like Book Creator and Explain Everything provide the same possibilities. For example, Bec Spink has made books using Book Creator with Preps. Beyond these three applications, Tony Vincent provides a range of applications for making and creating on both mobile and the web which is useful. In regards to creating, there as just so many possibilities, it all comes back to what you are trying to do and why. For more ideas in regards to iPads, I highly recommend Tony Vincent’s fantastic infographic on the iPad as the ‘Teacher’s Pet’. As well as scrolling through Alex Herbert’s extensive list of resources on Pinterest which was shared with me by Corrie Barclay. At the end of the day, I have found the biggest challenge with only having one iPad in the class is that you can’t do all three things at once. You might have a group creating a video, while you are wanting to document learning. This is why it is so important to think about how you do things. By using applications like Google Apps, it means that if you do not have the iPad, you can at least fall back to the laptop to do your work. What about you? 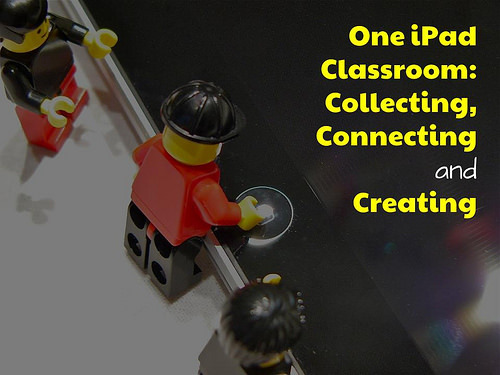 Do you teach in a one iPad classroom? What has worked? What have been the challenges? As always, would love to hear your throughts. One iPad Classroom – A Crowdsourced Reference by Aaron Davis is licensed under a Creative Commons Attribution-ShareAlike 4.0 International License. Like with most things, imagination coupled with trial and error play a very large part in something like this. Thinking of ways in which one device can not only be ‘used’, but used purposefully as either a device to teach, a device to learn from, or both requires a little thinking outside the box, especially when wanting to do things that perhaps have not been not before or are deemed as common practice. I am a huge fan personally of using a single iPad to collect formal, informal and anecdotal evidence of student learning. I used to love using Soundnote as an app for conferencing reading sessions and recording students reading aloud. Also, something such as having a class Twitter account and using the iPad device to snap away throughout the day and keep parents and others informed of what awesome things were taking place! The possibilities really are endless, we just need to stimulate that imagination! I could not agree more with what George Couros calls the ‘innovative’ mindset. I wonder though if this is sometimes limited by those above. Maybe it might be leaders within school or government. I understand the concern from legal in regards to applications and data etc … However, how much support and encouragement is there? We need to foster imagination and celebrate trial and error, not stifle it as can sometimes be the case. 1 Ipad in a class can be tough – but as you say, still lots of possibilities. Our blogging apps which will soon come complete with a hosting service were specifically designed for classrooms with shared devices. They are well loved. If you would like to be an early adopter and give it a try, you can subscribe or send me an email. Hey Phillip, sounds interesting. My question though is why would schools go with Easy Blogs as opposed to other platforms like Edublogs and Kidsblog? For example, the Victorian government provides access to Global2. The question that seems to be asked quite a lot lately is where is the data being held? Locally? Also, what data is being collected? It is really interesting times for applications in education with a lot more scrutiny post Snowden.